Fall is here with this turkey time favorite! Imagine fresh cranberries resting on top of a bed of sap covered scotch pine needles. This Natural Beeswax Candle brings fall and thanksgiving to your home! 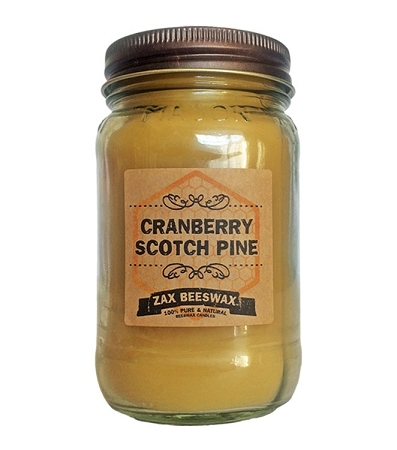 CRANBERRY SCOTCH PINE - Fresh Pine needles with masculine, woodsy notes followed by a light, tart, and sweet cranberry finish. Ingredients: 100% Pure & Natural Beeswax, Coconut Oil,  Phthalate Free Fragrance Oil, Zinc-Free Natural Cotton Wicking. The candles Zax have are devine. Burns perfectly and the fragrance is spot on for enjoyment.